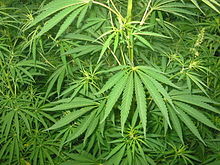 Cannabaceae is a smaw faimily o flouerin plants. As nou circumscribed, the faimily includes aboot 170 species grouped in aboot 11 genera, includin Cannabis (hemp, marijuana), Humulus (hops) an Celtis (hackberries). This page wis last eeditit on 8 November 2015, at 22:52.